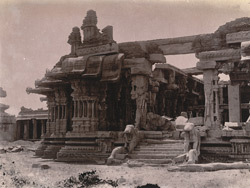 Photograph of the entrance porch to the Kalyana Mandapa of the Vitthala Temple at Vijayanagara, taken by Henry Hardy Cole in the 1880s. The Vitthala Temple is one of the greatest monuments of the Vijayanagara period and dates to the sixteenth century. The complex is set inside a rectangular court. The principal feature of the temple is the Kalyana mandapa (a hall for performing the wedding ceremony of the deity) as shown in this view. It has three entrances with flight of steps to the east, north and west, flanked by elephants balustrades and the moulded basement is adorned with friezes of lions, elephants and horses. The massive granite piers are made of clusters of colonnettes which emit tones when tapped. The peripheral piers are carved with rearing animals and riders forming composite brackets. The overhanging eave is double-curved.